When you’re running a web application, you want to be prepared for any issues that may arise, from 500 errors to your users telling you that your site is down. 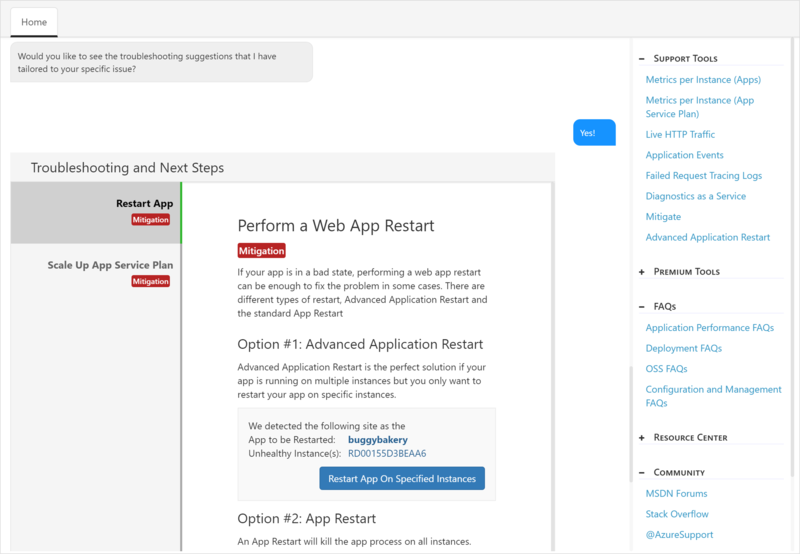 App Service diagnostics is an intelligent and interactive experience to help you troubleshoot your web app with no configuration required. 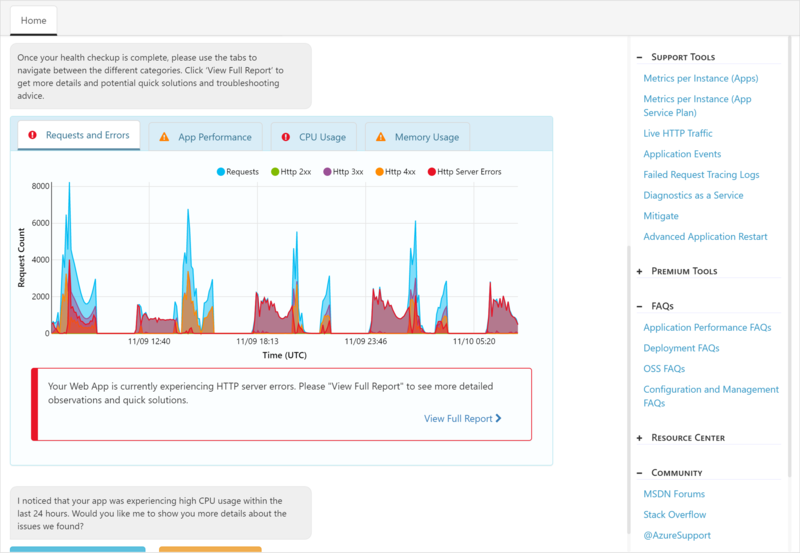 When you do run into issues with your web app, App Service diagnostics will point out what’s wrong to guide you to the right information to more easily and quickly troubleshoot and resolve the issue. Although this experience is most helpful when you’re having issues with your web app within the last 24 hours, all the diagnostic graphs will be available for you to analyze at all times. Additional troubleshooting tools and links to helpful documentation and forums are located on the right-hand column. 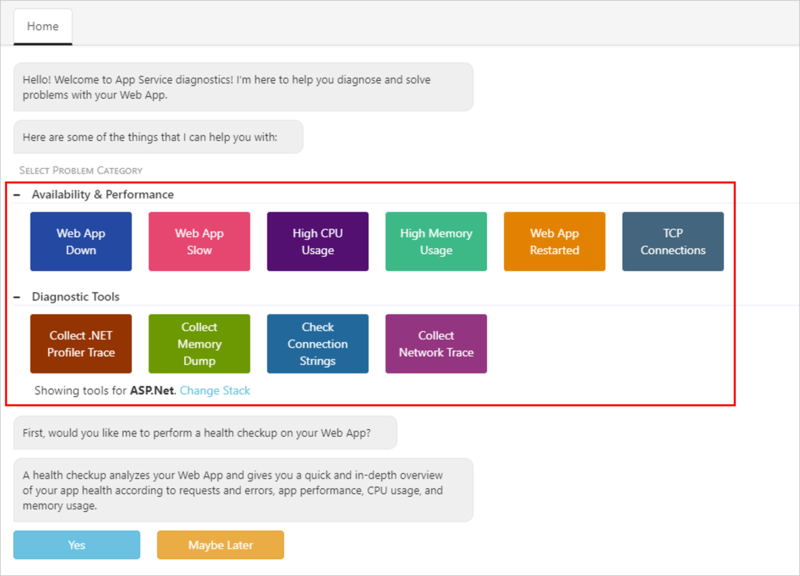 App Service diagnostics works for not only your app on Windows, but also apps on Linux/containers, App Service Environment, and Azure Functions. To access App Service diagnostics, navigate to your App Service app or App Service Environment in the Azure portal. In the left navigation, click on Diagnose and solve problems. For Azure Functions, navigate to your function app, and in the top navigation, click on Platform features and select Diagnose and solve problems from the Monitoring section. If you don't know what’s wrong with your web app or don’t know where to start troubleshooting your issues, the health checkup is a good place to start. 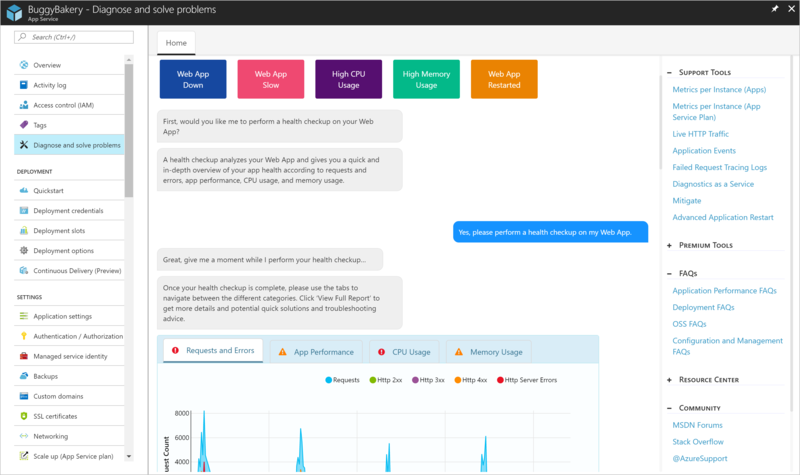 The health checkup will analyze your web applications to give you a quick, interactive overview that points out what’s healthy and what’s wrong, telling you where to look to investigate the issue. Its intelligent and interactive interface provides you with guidance through the troubleshooting process. If an issue is detected with a specific problem category within the last 24 hours, you can view the full diagnostic report and App Service diagnostics may prompt you to view more troubleshooting advice and next steps for a more guided experience. If you know exactly what kind of troubleshooting information you’re looking for, the tile shortcuts will take you directly to the full diagnostic report of the problem category that you’re interested in. Compared to the health checkup, the tile shortcuts are the more direct, but less guided way of accessing your diagnostic metrics. As a part of tile shortcuts, this is also where you will find Diagnostic Tools which are more advanced tools that will help you investigate issues related to application code issues, slowness, connection strings, and more. Whether you want more information after running a health checkup or you clicked on one of the tile shortcuts, the full diagnostic report will show you relevant graphed metrics from the last 24 hours. If your app experiences any downtime, it's represented by an orange bar underneath the timeline. You can select one of the orange bars to select the downtime to see observations about that downtime and the suggested troubleshooting steps. 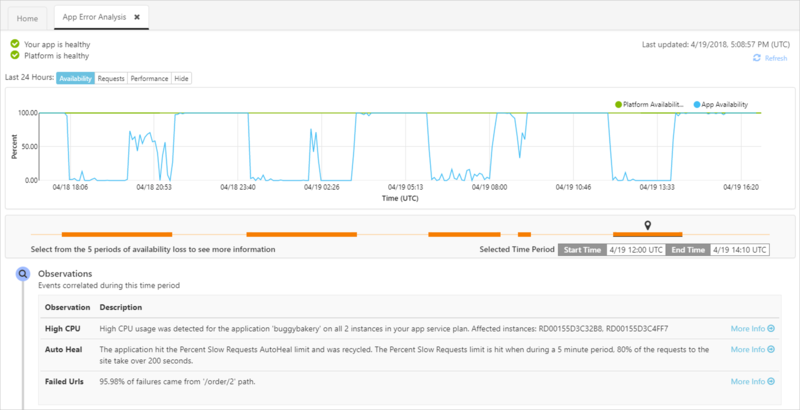 Because many app issues are related to issues in your application code, App Service diagnostics integrates with Application Insights to highlight exceptions and dependency issues to correlate with the selected downtime. Application Insights does have to be enabled separately. To view Application Insights exceptions and dependencies, select the Web App Down or Web App Slow tile shortcuts.